Here is the first one. 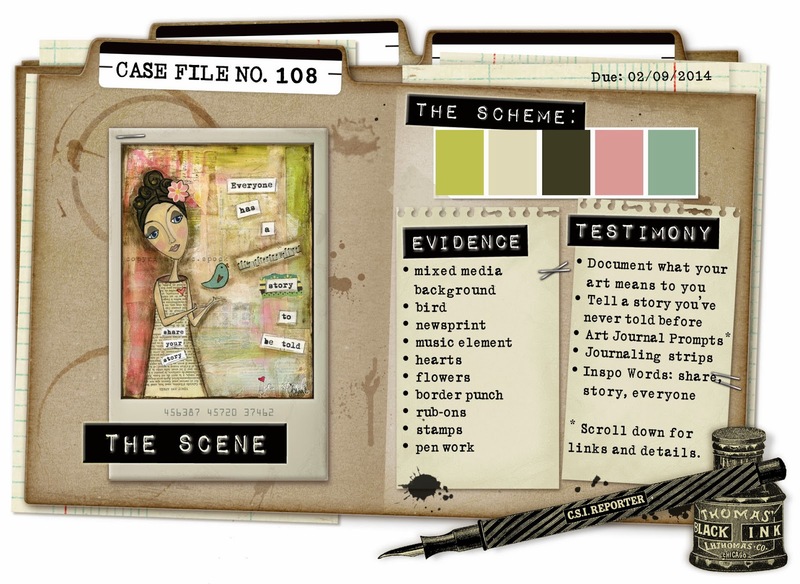 The new case file over at CSI and this week the colour palette is just gorgeous. It was kind of perfect for me this week because I love the arty feel of the photo inspiration and I am doing an online class at Pop and Colours which has been a real eye opener for me. They have an incredible line up of teachers and all the layouts are done on video - if you are interested in mixed media you really should take a look. I took my inspiration from the amazing Riikka Kovasin's class who I also have pleasure of being on the DT of CSI with. Thanks Rikka for always inspiring. Evidence - Mixed media background, birds, newsprint, hearts, flowers, stamps. Testimony - Document what your art means to you. The world of reality has its limits; but the world of imagination is boundless.. and ..
As long as we have memories yesterday remains. As long as we hope, tomorrow awaits. As long as we have art today is beautiful. For as long as I can remember I have enjoyed making pretty things and I always remember my grandmother, who was incredibly talented, encouraging me gently in my endeavours. It was only when we came to South Africa in 1980 and I was struggling to fall pregnant and my mother was dying that I got involved in pottery as a means of distraction and I loved it and I was pretty good at it - I still have some of it 35 years later and I was happy. Then the kids came along and all of that went out the window there was no time for anything else. I got back into creating when the kids left school - and I discovered scrapbooking and it was love at first sight. It involved paper, and colour mediums and photography. Over the last 10 years this art form has evolved and so have I but it has not been without its ups and downs. One of the hardest things for me to come to terms with is the competitive side of it. We do what we love and we want to share it but we don't like that it is judged and whether we like it or not it is judged... we are judged and we judge. Every time I enter a challenge and I don't win I am plagued with feelings of doubt and inadequacy. I don't want to do it anymore, but the pull of creating is so strong that I get back up and dust myself off an try again and again and again. I want to leave something behind for my children and my precious grandchildren. I realise that I know NOTHING about my parents and now it is too late and I want my children to know who I am and how I lived what I loved, hated, needed, did or didn't do. I want them to know what I was passionate about and why this hobby is so important to me. I want them to know what they mean to me. Everything I have done has been to make sure that the memories they have are well documented. I have done classes to learn new techniques, I have done a photography course so I can take better photos and through CSI I have learned that I have stories so hopefully they will have it all. I started of with a piece of watercolour paper to which I adhered newsprint text and strips of masking tape, then coated the whole thing with a layer of gesso, once that was dry I used Lindy's Stamp Gang mists in Sea Grass Green and Cotton Candy in opposite corners... I used my watercolour pastels to intensify the colours. Then came the stenciling down the center of the colours. I sprayed this with Clam Bake Beige and coloured around some of the circles to highlight them. The quote was stamped down the side. I also added some strips of dry wall tape for added texture. Once my layout was complete I took the tubes from the misters to draw the circle around the whole photo mat. The little flowers were cut using my Tim Holtz die cut. Then the hearts were added to the circle. Val, this is stunning. You have found your wet medium groove and this is pure perfection. I love your journaling and how much you share about yourself. I also don't like the competitive side of the scrapping industry. I will continue to scrap for me and the enjoyment I get from it. I know that the ministry we are called to will always have to be my priority so I don't apply for DT positions...and that works for me. This is really lovely, soft colors, and beautiful journalling too.. I LOOOOVE it! The whole way it's 'evolved' is just brilliant:):) And I Reckon you'll now be definitely hooked on MM!!!! 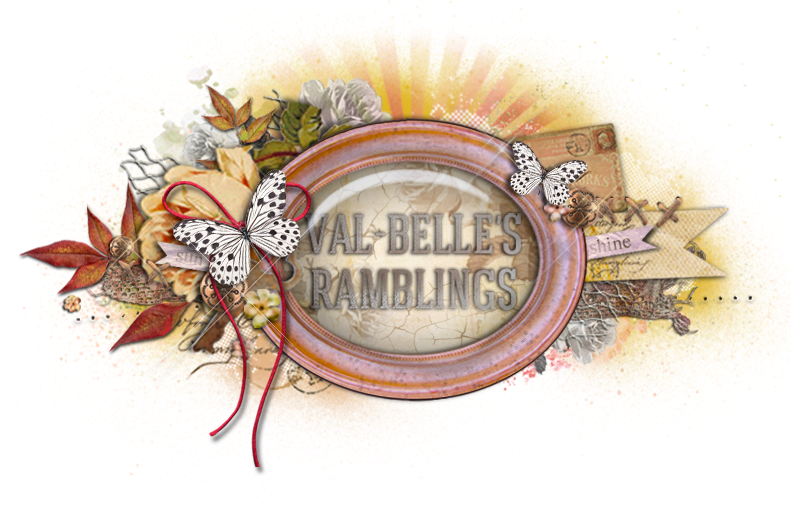 Val this is stunning! You have definitely got the hang of the MM thing! I would be hooked too if I could produce something as beautiful as this !